1334 BCE. Eighteenth dynasty Egypt. Queen Ankhesenamun is plagued by dreams in which she sees two futures. She never knows when a decision will lead to one of these futures. Her dreams have warned her of a blond-haired man who she will fall desperately in love with — and who will die by her own hand. When the man comes into her life, she is determined to avoid him in order to save his life. But she is irresistibly drawn to him. 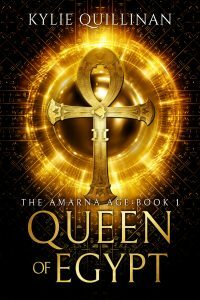 When Pharaoh’s advisors move the court from the desert city of Akhetaten back to ancient Memphis, Ankhesenamun is thrown into a new world of danger, secrets, and old gods. Somebody wants her dead and she doesn’t know who she can trust. Can she keep herself alive long enough to save the man she loves?